The ease and convenience of energy in our homes can make it difficult to remember that it’s not an unlimited resource. Each day, we make decisions to use power and energy for most of our needs. Often, we don’t think twice about the resources we’re using. There are many ways to lower our environment impact from the comfort of our own homes; adjusting some lifestyle habits has the potential to both save energy and to save money. In fact, with diligence and some strategic planning, your green lifestyle choices can offset the costs associated with buying and owning your own home, all while helping reduce waste and protecting the environment. Read on for actionable tips that can help you save money and manage your environmental impact at home. An easy way to go green and save energy is by aligning your schedule with the sun. During the summer, daylight hours are long and there isn’t much of a need for light bulbs. However, seasons like spring and fall have a limited amount of daylight hours, which means if you get up at sunrise and accomplish what you need to do by sunset, the amount of electricity you use in your home will likely lessen. While using light bulbs in the winter is pretty unavoidable, taking advantage of the daylight hours can help reduce your overall energy usage and costs. Along with the sun, it’s also beneficial to use other natural resources to complete everyday tasks. Apart from air conditioning, your clothes dryer and water heater are your second most expensive appliances to run. Laundry machines make life a lot easier, there’s no doubting that. However, by making small changes, like washing your clothes in cold water instead of hot water, you can save up to 90 percent on energy costs. Similarly, if you put forth the extra effort to line dry your clothes, you can expect to reduce your power bill by letting the sun and air do the work. These small changes can reduce your overall energy usage with little effort; and you can always use your dryer when you don’t have time to let clothes air dry. Another element that can be used to your advantage is rainwater during wet seasons. Use buckets to collect rainwater, then you can use what you’ve collected to water your garden and any other plants you have in your home. Rainwater often gets swept into the sewers, so finding any alternative use for it will put it to better use than letting it go down the drain. If your home has a small yard or garden area, planting a kitchen garden will help you save resources in several different ways. Kitchen gardens, where you grow some of your most commonly used fruits, vegetables and herbs for household use, can be as small or big as you want them to be. Not only do you save money on veggies, you also know exactly where your food comes from. Many neighborhoods have community gardens that people can order vegetable baskets from, so if you are unable to grow your own garden, this may be a good alternative. Although it may be convenient and cheaper to buy veggies from large grocery stores, buying local is often an environmentally-conscious decision. Vegetables, fruits and herbs travel far and wide to be sold at chain groceries, which contributes to the high number of food miles that contribute to environmental pollution and global warming. Before buying groceries, do some research as to where your food comes from. If a product is imported from a country that transports food by airplane, consider looking for an alternative, as food that is flown from its country of origin contributes more emissions than food that is transported on ships. However, if you can skip purchasing fruits and vegetables altogether by growing your own produce, you’ll decrease your ecological footprint much more. Having a flourishing kitchen garden with some accessory flowers is an easy and affordable staging tip, as environmentally-conscious home buyers consider gardens to be a valuable home amenity. “Phantom energy loss” is an energy drainer that often flies under the radar. Most people don’t realize that their electronics continue using energy, even when they’re turned off. As long as appliances are plugged into an outlet, they are using energy. There are a few ways to combat this, including using power strips, decreasing the number of appliances you rely on and unplugging electronics when they’re not in use. Decreasing the number of appliances you keep plugged in can not only combat phantom energy loss, it can also declutter your home and give it an appealing, minimalistic look. You can reduce your energy use, save money on your power bill and increase the aesthetic appeal of your household by keeping your appliances put away and only bring them out when you are planning to use them. You can also simply use power strips that switch off and do not use any energy unless they’re turned on. Solar power is one of the best investments you can make to shrink your energy footprint, as this will essentially cancel out your power bill, but if you aren’t ready to make that investment, you can reduce your energy usage by investing in energy-efficient light bulbs and other appliances. Powering your house with solar energy is an investment in sustainability that can also impact the market value of your home, as demand for alternative energy will likely continue to grow in the future. The average American produces 4.4 pounds of garbage each day — that adds up to about 254 million tons of yearly waste in the U.S. All of this garbage has resulted in 2,000 active landfills across the country that are used to bury garbage. Only a few major cities in the U.S. (NYC, San Francisco) have adopted strict recycling laws that enforce minimizing waste. However, because most states have plenty of room to store garbage, Americans have not prioritized waste reduction. That doesn’t mean you have to wait for municipal laws to change your behavior and take bolder action to cut your own waste and footprint. Other small ways to reduce the amount of trash you produce are by quitting one-use plastics, such as plastic water bottles, sandwich bags, straws and plastic utensils. Reusable water bottles are environmentally conscious and getting used to carrying them will save you from constantly purchasing plastic water bottles. Get accustomed to using cloth kitchen towels rather than paper towels for your everyday needs to reduce the waste produced by paper towels. Investing in a few pieces of reusable tupperware can eliminate the waste of sandwich bags and paper lunch bags. Waste reduction isn’t just an indoor project; consider starting to compost your organic waste and replacing your lawn (and any lawn clippings) with a more sustainable yard. Even if you’re not ready to go totally green, there are small lifestyle adjustments you can make that will help reduce your environmental impact. 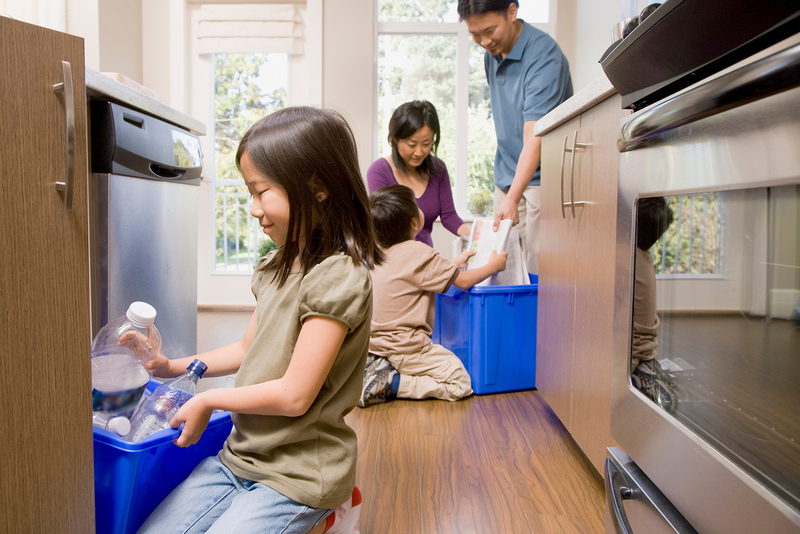 Reducing your waste production can make a huge impact and may be an important step to take, especially if you’re living in or considering moving into an environmentally-conscious neighborhood. Every person’s efforts can make a difference, even if that just means carrying around a water bottle or using power strips. Reduce your carbon footprint and lower your impact with these money and energy saving tips — the planet (and your pocket) will thank you.